A religious festival was held to mark the 84th birthday of Kuruwiti Korale Judicial Sangha Nayake Ven. Asgangule Wimalararthana Nayake Thera recently. Nearly 40 bhikkus chanted seth pirith at the Eheliyagoda Mahara Purana Vihara main hall with the participation of devotees. Ven. Wimalarathana Nayake Thera has established a unique record in Sabaragamuwa by holding Bodhi Poojas for the well-being of the people for over 40 years. 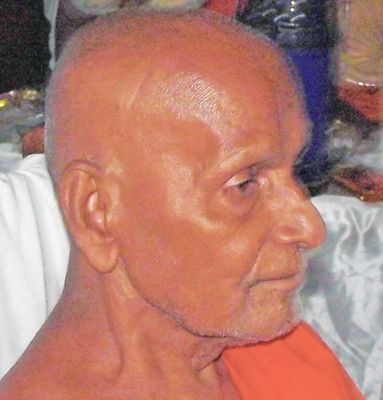 He is the Viharadhipathi of Mahara Purana Vihara, Epalapitiya Maha Vihara, Wiyalagoda Sri Mettaramaya, Polwatta Sri Pushparamaya and Asgangula Vihara. In addition, he possesses the title, Prawachana Keerthi Sri Wadhibhasinghe. He holds an All-Island JP post too.